Couplings and drives blocks represent power transmission elements and systems such as springs, dampers, pulleys, and drives. To model the dynamic transfer of torques and motions, connect these blocks together just as you would assemble a physical driveline system. Model a time-varying inertia using a variable ratio transmission. Model damping due to viscous friction. Lean about belt direction and using tensioners and inertias in pulley networks. Two flexible aluminum shafts modeled using a lumped parameter approach. Both shafts consist of 20 segments containing inertias, damping, and stiff torsional springs. At the start of the simulation, the clutch is unlocked and the driven shaft is free. Note that the initial velocity of the motor shaft is set to 200 rad/s and that the system starts at steady state. 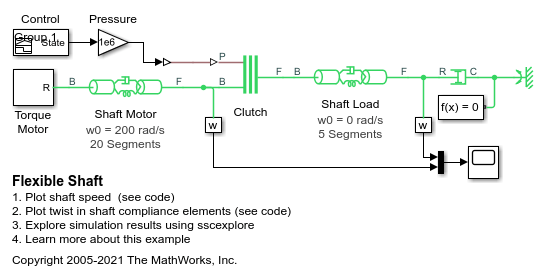 The clutch engages and disengages during the test, and during each event the effect of the shaft flexibility can be seen in the simulation results. Two flexible shafts that have torsional and transverse flexibility. 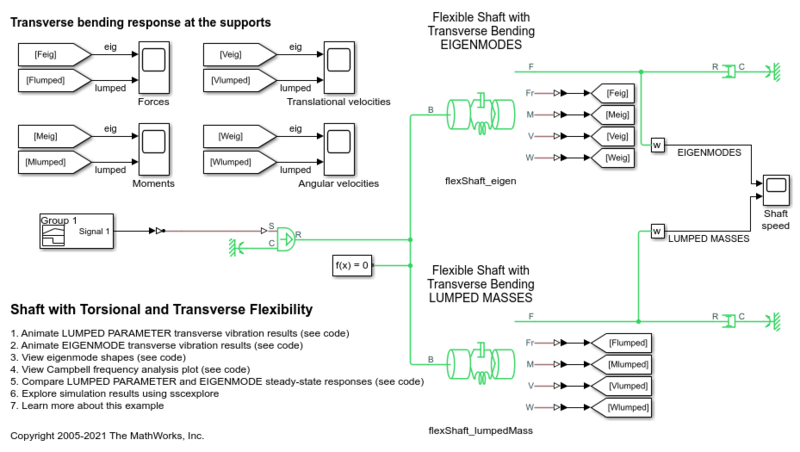 One shaft computes transverse motion using computed eigenmodes, and the other shaft uses a lumped parameter approach. The boundary conditions on the shafts can be changed on the block masks.